Jan Shatabdi Expresses were introduced in 2002 by the then Railway Minister, Shri Nitish Kumar (who is currently the Chief Minister of Bihar). The concept of these trains were to provide "Shatabdi express-like" speed, with non-AC accomodation. The concept also included offering a premium service (in terms of onboard services) at a cost affordable to the common man. These trains received specially manufactured coaches, that were fit to run at 120 kmph (compared to 110kmph for normal coaches, and 130kmph for Shatabdi/Rajdhani coaches). Jan Shatabdi expresses are accorded the same priority as a Shatabdi Express, when it comes to section control and these trains are usually allowed an uninterrupted run. In the initial versions, Jan Shatabdi Expresses (herein referred to as JS Express) had onboard catering, the cost of which was included in the price of the ticket. This concept, however, affected patronage in the train adversely and hence Catering was made optional. The fares collected for these trains are all-inclusive fares - which include surcharges and other fees like reservation charges. Today, there are over 16 pairs of Jan Shatabdi Express running around the country. These trains have specially designed coaches, painted in a distinctive livery. These trains provide AC Chair Car, and non-AC "Jan" Chair Car accomodation. The AC coaches seat 71 passengers, while the non-AC coaches seat 106 passengers each. The AC coaches have a 2x3 seating layout, and the seats recline. The non-AC coaches have a 3X3 seating layout, with non-reclining seats. The seats are designed in a manner, that half the coach faces the direction of travel, while the other half faces the other way. Interestingly, these trains lack luggage space. The end-coaches (SLRs in normal trains) are specially designed, and these coaches too accomodate passengers (81 of them). My first ever journey on a Jan Shatabdi express happened on June 13, 2009 (long seven years after these trains were introduced). This journey too was an opportunity, that presented itself by sheer chance of luck. I had to travel from my home town, in Kodungallur - Thrissur District in Kerala, to Trivandrum on a personal reason. 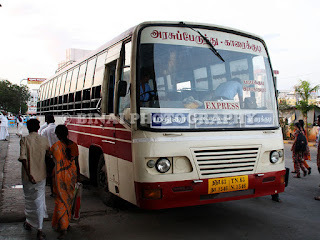 My initial plans were to take a bus from my place straight to Trivandrum. However, the prospect of traveling that long distance in a non-AC bus, given the sultry weather gave me jitters. 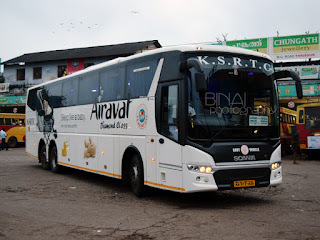 I decided to check out AC buses - but the available ones were either too late - and would land me up in Trivandrum at a very odd hour - or too early. So, the call was obviously for a train. It was then that I remembered about the Jan Shatabdi. The availability was checked - Bingo! 30 seats were vacant. I made a reservation quickly, and I got a window seat in C1. On the day of the journey, my brother dropped me at Ernakulam Junction station. The time was just around 1630. The rake of my train was yet to be brought from the coaching yard. Announcements were being made that the train would be brought to Platform 2 very soon. Platform 3 had two passenger trains parked 'back-to-back', while Platform 4 had the Trivandrum bound Raptisagar express. Platform 5 had the rake of an unknown passenger train. The rake of my train was brought in at 1655 by WDM3A #16479R of Erode. The rake was about 14 coaches long - one AC chair car, eleven non-AC chair car and two brake vans. My coach- C1, WGSCZACJ 02151 - was the second from the loco. The loco for my train - WAP4 #22388 of Erode - was brought in at 1705. Interiors of my AC Chair Car coach... notice the fabric seat covers and the carpeted floor. Compare this with a normal AC chair car coach here. The crowd was more than average - most seats in Non-AC coaches were taken. 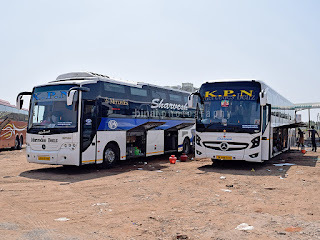 My coach had seven vacant seats, and all of them were allotted were unreserved passengers on first come first served basis. A few passengers in my coach were to board at Alappuzha. The Alappuzha-Chennai express arrived on Platform 1 at around 1719, with WAP4 #22244 of Erode doing the honors. The arrival of this train meant that the way ahead was clear for my train. The starter for my train was taken off on time, and we started from Ernakulam perfectly on time - 1725. The red monster up ahead was making merry of the 14 coach load and were cruising at decent speeds in no time. I was too tired after about three days of travel, and was now sitting in a state of lethargy. I remember the train rushing past the picturesque Aroor bridge, and later fell asleep. I vaguely remember the train slowing down at an unknown station enroute. I woke up as the train pulled into Alappuzha. We pulled into Alappuzha at 1823, late by about 5 minutes. We left Alappuzha at 1825. We were put on the loop line at Ambalapuzha. I was perplexed as to why was the Janshatabdi put on to the loop line. We had a crossing here. We crossed the Kochuveli-Bangalore express here. The train was worked by WAP4 #22220 of Erode. We continued our good run after here. We reached Kayamkulam at 1917 - delayed by 17 minutes. Quite a few passengers de-trained here, while an equal number got in. My co-passenger too changed at this station. We left Kayamkulam at 1918. We kept crossing trains at a steady pace - the cumulative speed of both trains and the darkness meant that all I could see was a streak of light. We reached Kollam at 1953 - late by 16 minutes. My co-passenger was saying that the train cannot make up time and we would reach Trivandrum only at 2115 or so. I was slightly disappointed about this. The Mangalore bound Malabar express pulled into the nearby platform now. We left Kollam at 1955. The stream of crossing trains continued, while we continued our journey ahead. Varkala was reached at 2018 - late by 15 minutes now. We left the station a minute later. Interestingly, the crowd in the train was consistent, and most of them were upto the destination station. I loved my first ride on the Jan Shatabdi. The seating was comfortable, and the seat design was nice. My only sore point is that the coach seemed to be badly kept. From the stickers inside the coach, and the Tamil Nadu tourism posters, I gather that the particular coach was being operated on the Coimbatore-Thanjavur Jan Shatabdi. The seat covers were torn in some seats. These would get attended to at the next POH - but these things are not consistent with the "premium" projected of a Jan Shatabdi train.